The commonest rejoinder to any design argument in nature, you will no doubt have noticed, is “Who’s the designer, then?” Although the ID reply is actually perfectly rational – that inference to design cannot, intrinsically, tell one the nature of the designer in detail – the question is in reality just an over-elaborate, if hackneyed, attempt to show that there is a hidden agenda of religion which, once uncovered, would render design unscientific in principle and, probably, a threat to the body politic. It’s Catch 22 – stick with methodological naturalism and design is deceitful creationism: mention God in reply to the question and it’s an illegitimate insertion into science. But it’s unnecessary. After all, the same methodological naturalism that excludes God as “supernatural” (by some undefinable division of reality) also excludes teleology (final causation), and therefore, design itself, the latter with a much longer pedigree going back to Bacon’s rejection of Aristotle. A more consistent scientific rejoinder to design arguments woud therefore be, “We have defined science so as to make it blind both to design and to God, so have nothing to say on them.” The “Who is the designer?” question, itself philosophical rather than scientific, has the advantage of turning science’s methodological blindspot into an apparent philosophical virtue. God must appear hidden to scientists studying nature because, if you consider the matter, there is absolutely nothing God could ever do that would make him visible. The second rejoinder to design arguments is like unto it, and on this I will now focus. It’s “How did the designer do it, then?” Like the first question, this one arises from the fact that methodological naturalism habitually breeds a degree of metaphysical materialism, to which its practitioners usually remain blind. For unless one has made oneself incapable of thinking beyond material efficient causes, it’s obvious that how the designer did “it”, where “it” is design, is by thinking about it and making a plan. That is orthogonal to the question of how the design was instantiated, and makes the manner of production largely irrelevant. Like the first question, the real motive is to force the implication of “miracle” and therefore “anti-science”, when it would be much more economical to say, as in the first case, “Science has excluded teleology methodologically” before ever asking such non-scientific metaphysical questions. We’ll talk guitars, since I have some to hand (nine, actually, to my shame, if you don’t count the ukelele). 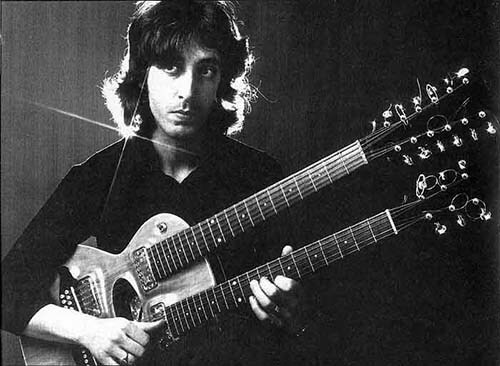 Each guitar was designed by someone, by thinking about it. As an aid to that, they may have made sketches, or detailed drawings, or lists of specifications and parts, by hand or by machine, or by verbal instructions to an apprentice. You simply cannot tell anything about these by examining the guitar, though the design is embodied in the artifact. Neither can you readily tell if the manufacture was by human hand or executed by programmed robots. In fact, even variations in the basic construction techniques do little to affect the basic design. Birdsnest wiring was often replaced with a PCB in the history of electric guitars. Screws were used instead of glue, or cross-head screws instead of slotted, or plastic instead of celluloid. If you choose, you can investigate the exact mode of manufacture – and you will still add nothing much to the fact of design. Here’s another example. 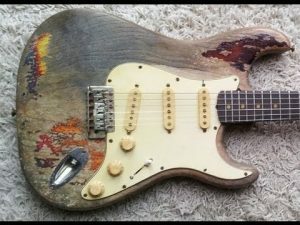 The Fender Custom Shop sometimes creates limited editions of iconic individual guitars, such as this famous “battered Strat” played by the late Rory Gallagher throughout his career until his death in 1995, seen wearing its battle scars with pride. It was reportedly the first Fender Stratocaster imported into Ireland in 1961, and a fifteen year old Gallagher scraped together £100 to buy it, used, a year later. It was soon stolen and recovered from a ditch, played hard round the world, refretted several times and suffered inevitable knocks. Gallagher’s sweat proved corrosive to the cellulose finish, which progressively peeled, assisted on the front by friction from his trademark chequed shirts, and on the back from his habitual denim jeans and belt buckles. 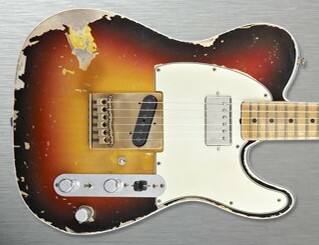 Fender set out to reproduce each scar faithfully, and “initially built forty clones for the European market”. The Custom Shop luthiers know their job (“It’s not easy to get paint to crackle right”), to the extent that another guitarist (I think it was Andy Summers of The Police) holding their facsimile of his own instrument, had the uncanny feeling that it was the original, though he knew that to be at home a thousand miles away or more. Personally I can understand why someone might delight to own an instrument once played by their hero. I myself sold my car to buy a trademark doubleneck guitar that belonged to the great Gordon Giltrap – and later sold it back to him, but that’s another story. I can’t really see why you’d pay three and a half grand for something new that looks like it belonged to him. But the point here is that though Gallagher’s guitar was, of course, designed, its life history was not. At any level below universal divine providence each dink and stain was accidental, and easily identified as such. But put it side by side with forty identical others, and suddenly, in this case, repetition of accident is clear evidence of design. Damage to guitars is not produced identically through crystallisation or convergent evolution. If the careful reproductions are good enough, you won’t be able to tell them from the original. So, having decided that most, if not all, of these forty-one guitars had their scars designed, we ask “How did the designer do it?” As I said before, the correct answer is “He thought about it”. But reducing that to material efficient causation, as the questioner clearly wants, the answer is as near as dammit “the same way chance produced the original”. He wants to simulate blue-jean wear? Then he rubs the guitar with denim mercilessly. There are burns where cigarettes were jammed under the strings in the headstock (though not in Gallagher’s case – he was a non-smoker)? Then break out the Marlboroughs. And so on. Comparing the original with the clones, not only the appearance but the means of production are (as close as the Custom Shop could manage) identical. Yet the idiosyncracies of the first were produced by chance, and those of the rest by design – thus demonstrating that design is a non-material cause over and above physical processes, as design theorists and Aritotelians have always claimed. 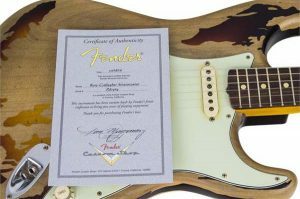 Now, of course if living things are designed, they are not imitations of living things produced accidentally, as Fender tribute models are of guitars that have accompanied famous careers. But they do have a history of efficient causation, which science can legitimately, if incompletely, study. If we believe we are able to say that it was done entirely by variation and natural selection (which we really can’t in the middle of today’s paradigm shift, but leave that aside – any proposed mechanism will do), then the answer to the question “How did the designer do it?” is simple – by variation and natural selection, just like the science says. I just have to include a clip of Rory Gallagher actually playing the battered Strat. The ostensible serious purpose is to show how, paradoxically, a human artifact can become so familiar to its owner that it almost is a part of him. And that, I suppose, is the appeal of the relic, if not so much of the cloned relic. Within the sweat- and denim-ingrained swamp-ash is somehow preserved the soul of the musician.